Whilst Dave had the sun of Lanzarote – Graham had the weather of Ringwood. Hooray, the triathlon season has finally come around. The Ringwood Triathlon is a pool based tri, which is just as well as it is still rather nippy for an outdoor swim just yet (although Dave P will probably say otherwise!!!). I am using this one as an indicator to judge how well my winter training has gone. As I have progressed to nearly an “elite swimmer” (who are you trying to kid! -Coach 2), I had a swim start time of 8:35 so we didn’t have to get up too early but when we did leave the house, we found that the temperature was reading a rather chilly -2 but as I had already prepared for this & had gotten all the right gear ready for the bike section, I would be nice & toasty. 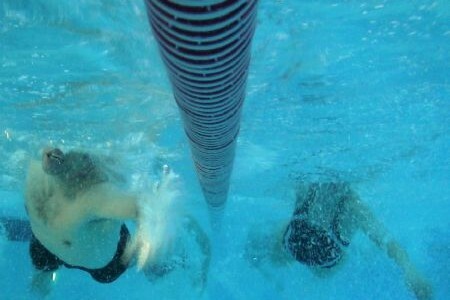 I had two other competitors in my lane for the 600mtr swim (24 lengths) & I was off second & soon found that I was swimming comfortably behind No. 1 so I overtook him but then decided I should have probably stayed where I was but I just got on with it. Then swimmer No. 3 overtook me (female) & this is how it stayed for the rest of the swim. I exited the swim & ran outside to transition & it suddenly hit me just how cold it was. I towelled myself off so as not to get a chill out on the bike. My bike kit consisted of 1 pair of socks (plus toe warmers over the shoes), 2 pairs of gloves & a winter jacket. I headed off onto the 28 mile (1 lap) undulating bike course & within the first mile or so I had caught one person but then for the next five miles it was all very lonely as there was no-one around at all. However, it wasn’t too long before the fast boys started to overtake me. I did however manage to hang onto one guy who overtook me (within the legal distance of course) & then “Mr RAF” came flying past the both of us & the speed went up another notch, but as we climbed the hill out of Bransgore it was just me & Mr RAF left. Eventually I just couldn’t hang onto him so I watched him disappear into the distance so I settled down into my own rhythm, but to my surprise, or relief, at the top of the Bolderwood climb, he was on the side of the road trying to sort his bike out so from then on & to the finish I just got on with the job in hand & was starting to catch people from the wave in front of me. I entered T2 ,which took a little bit longer than usual as I had to take so many clothes off, but once onto the run, it was so painful for about the first 2K because my feet were so cold. However, once they had defrosted, my running started to come to me & I started overtaking people which kept the motivation up but it took a slight downward turn when the very fast running Will Newbury flew past me, literally, but soon forgot about that & just concentrated on what I had to do. I will just say here that the course isn’t quite 10K as it is 5.75 miles however, I was pleased with the final 2K because I could see a friend in the distance & had wanted to try & catch him because he was in the wave in front of me so it was a big chase to catch him with about 400mtrs to the finish line. Job done. Conclusion: With it being so cold, the bike time was a bit slower than last year (Sept so not a real comparison!!) but most pleasing was the run so I’m moving on now to the next race.